Amazon aluminium downpipe are provided in a variety of shape and size configurations to suit all purposes. All our rainwater downpipes are produced in profiles that are compatible with traditional and modern construction methods and styles spanning the complete range of applications. Amazon cast aluminium pipe connectors will match those formerly made from cast iron in either refurbishment or replica new build. With gutter systems to compliment the pipework, we have a solution to any requirement, large or small, finished in Polyester Powder coat and available in a range of colours. We can supply and fit a range of aluminium downpipes: please see below some examples. A range of circular rainwater downpipes are available with a cast connector in 63mm, 76mm, 101mm and 150mm profiles and lengths ranging from 0.5 to 3.0metres in mill or polyester powder finish. 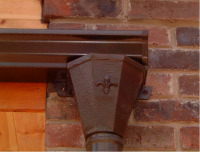 A range of square / rectangular swaged downpipes are available with a cast connector in profiles of 63mm x 63mm and 76mm x 76mm (square) and 101mm x 76mm (rectangular). Lengths ranging from 0.5 to 3.0metres in a mill or polyester powder finish. The extruded aluminium flush fitting security pipes are supplied in 2 metre lengths with special secret fixings. The security pipes are manufactured in a vandal resistant aluminium which will not shatter or split. The benefits of this are that it is unclimbable and non-grippable. The security pipes come with a smooth visual appearance with no sockets or pipe clips. Available in 76mm round, 76mm x 76mm square and 101mm x 101mm square profiles in a mill or polyester powder finish. A wide range of RAL / BS colours are available. 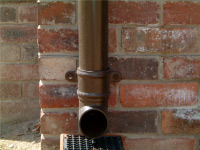 For information or a quote on downpipes please contact us.